NBA history: Who has the best post moves? Who Has the Best Post Moves in NBA History? 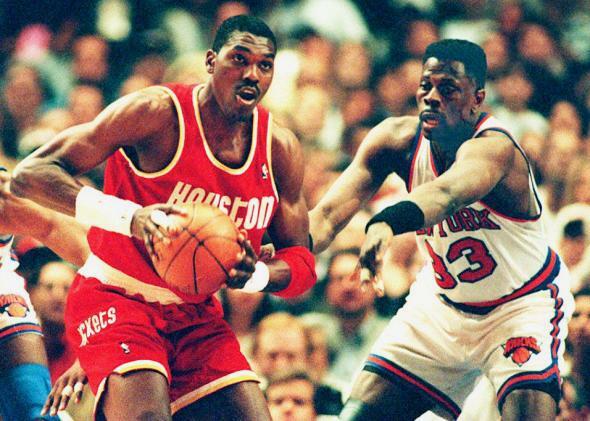 Houston Rockets’ Hakeem Olajuwon, left, looks to pass the ball under defensive pressure from the New York Knicks’ Patrick Ewing during the NBA finals at Madison Square Garden in 1994. It’s definitely not Kareem. He is one of the greatest ever NBA players and indisputably had the most dominant post move in NBA history—the sky hook that is rightly considered the single most devastating NBA post move. Virtually unstoppable and highly effective from nearly everywhere as Kareem’s career went on, but as good as it was, one ridiculously effective move doesn’t qualify a player as having the best post moves in NBA history. It’s categorically not Shaq. He’s a good man and one of the strongest, though not nearly the strongest player to face. While he developed some moves around the basket, he wasn’t a post move–based big. He clearly doesn’t have the best post moves in NBA history. I consider Tim Duncan the best all-around center I ever played against. I also played uncannily well against him, which serves my ego well. His ability to use absurdly simple and effective means to score seemingly without effort—to this day—marks him as extraordinary in the post in my books. His trademark is not prolonging any move beyond the lowest level of difficulty or “frills” to score. By definition he uses a more limited number of moves than a series of other effective post players, so I don’t think it’s him. I love his game and respect him greatly, but he doesn’t have the best post moves in NBA history. For me it is between Hakeem Olajuwon and Kevin McHale. For McHale, as his career developed, he had the largest assortment of regularly employed, distinct post moves, as well as some regularly employed old favorites. But it should also be noted that what made him so effective before they were used was his ability to gain perfect position that often meant—especially earlier in his career—that the move was not even necessary; he’d just take the layup (this in itself is a great skill and not meant as a slight). As McHale’s body failed him, his moves and cleverness in the post became even more pivotal to his longevity, and that’s why he continued to evolve them, and a long-range shot. McHale was a joy to watch because on some level you knew that without his entire arsenal of post moves, his career would have been considerably shorter and his success considerably lessened. In contrast, Hakeem’s post moves seem almost gratuitous at times. He didn’t need them to be an all-star, but the smoothness, integration, and personally identifiable style of his array of post moves was unique in the game. Often imitated, sometimes attempted to be learned, but I haven’t seen anyone really “get” what he did. For the record, I think Dwight Howard would be better served by lessons from Kevin McHale than Hakeem. I don’t think Dwight’s mind or instincts operate in the same way as Hakeem’s, and to use a clumsy metaphor, the two styles of post play are completely different operating systems, and Howard’s is more akin to Kevin’s. I just think he (rightly) thinks Hakeem’s look contemporarily cooler! Intergenerational comparisons in basketball are usually unsatisfying and generally very subjective. If the definition of moves is about the number of unique combinations rolled out on a per game basis, then McHale and Olajuwon are near neck and neck. Kevin McHale had an amazing array moves but probably not as many combinations as fans misremember. Conversely, many may think Olajuwon was just about the “dream shake,” but take a look at how many combinations with additional spins, step throughs, “up and under,” and fakes he used—few moves were identical. It could be argued that they were derivational, but I’d say that for both players. If I had to chose, I refer you to my soft spot for underphysically-talented players who maximise their ability via amazing skill to give you your answer. Just don’t tell Hakeem, or he won’t pay for breakfast ever again. Honorable mention: Adrian Dantley. This man was a beast. He was nowhere near the height he’s listed at in the programs, yet he employed a variety of moves, along with an uncanny ability to get and maintain optimal post position to decimate much larger, more athletic bigs. He was relentless. He’s not really up in the top of this list, but who doesn’t like an underdog? If you’re wondering if I had any post moves … take a look for yourself. NBA Players: Who is more like Michael Jordan: Derrick Rose, Kevin Durant, Dwyane Wade, LeBron James, or Kobe Bryant? Great Athlete Debates: Who is the best professional wrestler of all time? Basketball: Who is the most underrated NBA player?